Our whale clock is featured on the Dear Dr.MOZ's baby blog! A legend in my own mind! I used to have a green faded t-shirt in high school that had "A legend in my own mind" printed on it. I thought it was pretty funny. 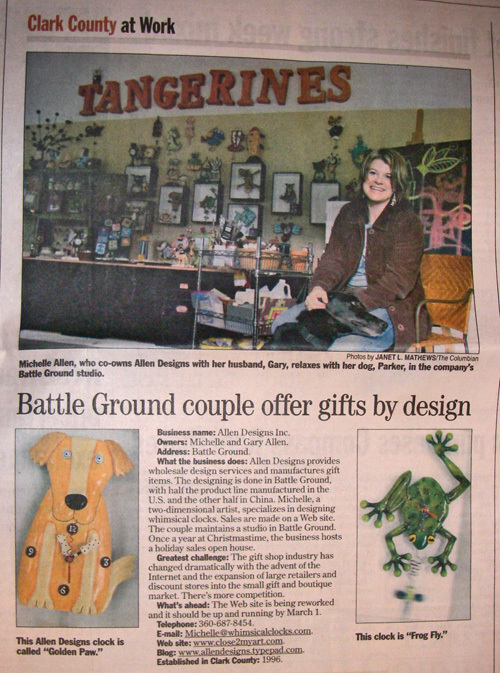 When my mom emailed me this copy of the article out of our local paper, The Columbian, she titled her email to me "your claim to fame" and it made me think back to that well loved T. If the print is too small to read you can click here to see it better. I'm still here in SF at the gift show. My in laws drove up into the city to take me to dinner tonight at Scalas, it was beautiful food! We had a great time visiting and laughing. We happened upon this great gallery, Cohen Rese Gallery, where Sharon & I spent a few minutes drooling over the amazing art, and Sid worked on promoting me to the very kind owner of the gallery, Don Cohen. Leave it to your parents to sing your praises! ha!